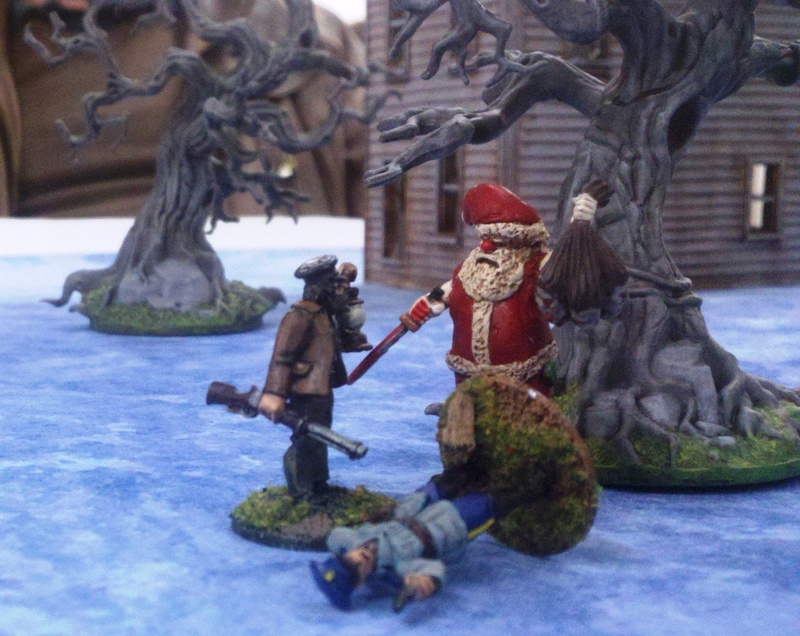 For our next game of Strange Aeons, I ran the Nightmare on 34th St holiday theme scenario. The scenario rules can be found here. Basically, an evil Santa is trying to grab kids before the Threshold Agents can rescue them. 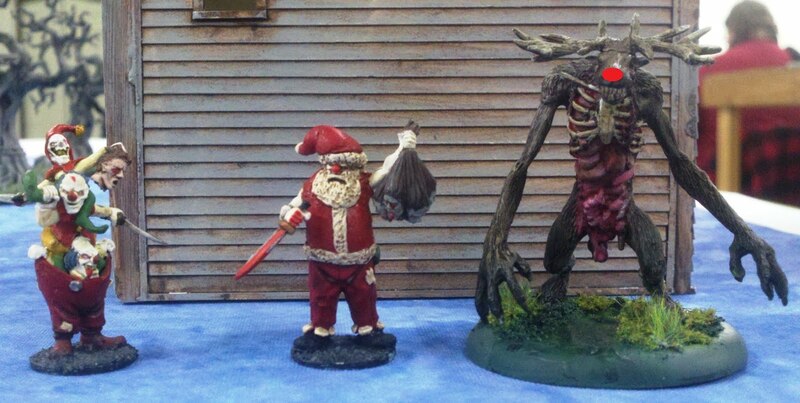 Here's the main Lurker figures in the Christmas posse: the Elves, Santa & Rudolph. Santa is the Horrorclix Jester figure in a padded putty suit. 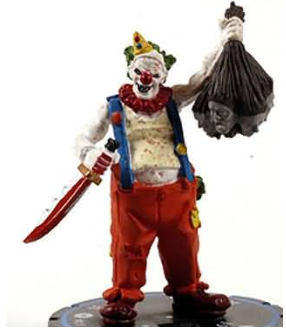 The Elves were the Cannibal Clowns, also from Horrorclix, with a bit of repaint. Rudolph is Skrapwelder's & from AE WW2. Here are the sugar drunk troublemakers that the Agents are supposed to rescue. & one from the Lurker's side. There wasn't much to the the game though. Since the scenario required Santa be a 7 pt Maniac, & I had 16 pts with which to buy Lurkers, I bought a bunch of 1 pt Cultists to bulk out Lurker forces. This meant the Lurker gang didn't have any commander figure. So, while all 4 of the Threshold Agents were activating at a time & rescuing the kids, only 1 Lurker could activate, which made it almost impossible to chase down the Agents or kids. Santa was able to cut down Officer "Just Arriving on the Scene", but the head Agent then took out Santa during melee. I should have forced all the kids on to make a Resolve check after seeing their rescuers slaughter Santa, but I didn't. The Threshold was able to rescue all the kids, only for the loss of the Police office. Overall, a quick but fun game. & now I've got the Santa figure ready for next year. I just have to find some more of those Elves. 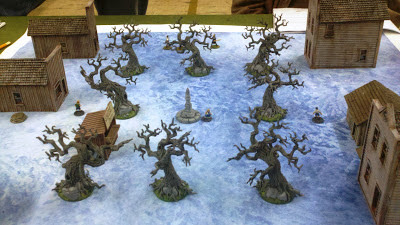 We played our 2nd Strange Aeons game a few weeks ago. This time, we did just a 1-on-1 game & it went a lot better than the larger game last time. We rolled up the Escape scenario where the Threshold agents have to make it across the board. I wanted the game to follow on from the end of the last game to continue the storyline. 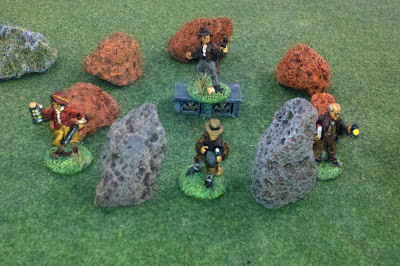 So the Theshold gang were trying to return from investigating the ritual circle they discovered last time. But the County Sherriffs were in the pay of the Moonshiners. 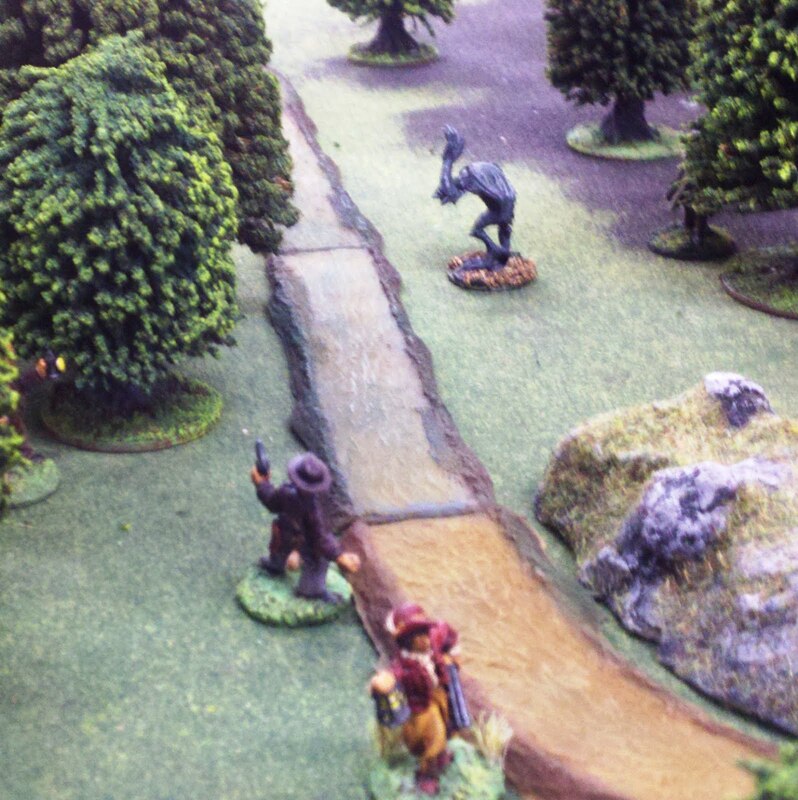 And since the agents had just busted up the Moonshiners, the Sherriffs decided to mosey on over to make sure the Threshold gang didn't make it out of the back woods alive. We also used the Twisted Fate deck for the games. It certainly added some big cinematic moments to the game. At 1st it seemed like drawing a card every turn would be too much, but having more cards to use in defense definately helped. It did seem suspicious that my opponent Skrapwelder, who printed up the cards, was the only one who got the "out of ammo" card. & that really hurt when he played it on my Lurker with the Tommy Gun. The 1st game had Skrapwelder running his new Threshold gang against my Sheriffs. & you know Sheriffs always have to have a bloodhound with them, so they brought a Zombie Dog. The rest of his gang: Betty Joe Bialowski, Jack MacAdam, & Officer "Just arrived on the scene"
The Threshold agents left the ritual circle after they completed their investigations, but were quickly spotted by one of the Lurker Sheriffs. "Hey Sarge! I can see those damn Carpet Baggers from up here. They're just leaving the Ol' Jed's nekkid dancin' spot." 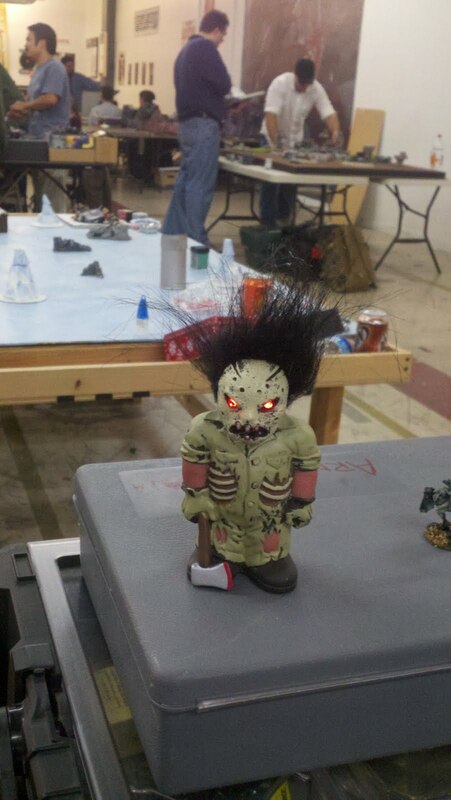 The Sergeant let loose his prize hound, Bubba. Which quickly tracked down and tore up Office "No longer appearing in this film"
Bubba was gunned down after that. Betty Joe then gave good evidence as to why she had been scouted by the local All Women's Baseball team. She quickly struck down 2 Sheriffs with her bat. This was one of the more fun cinematic moments caused by the Twisted Fate deck. The Lurker Sheriff had no melee weapon, so had to face Betty & her bat unopposed. Luckily he survived her 1st swing. Then Skrapwelder played on Betty the Divine Intervention card (immune to all damage) & Killing Blow card (+2 close combat). I then played Bad Luck (cancelling Betty's immunity) & my own Divine Intervention. So, even though Betty had a +2, she effectively couldn't use it. & the Sheriff at least had a chance to do some damage to her, which he didn't. She quickly beat the Sheriff down. That was all her 1st action in her turn. She then activated her Heroic skill allowing 3 actions her turn, with which she ran up behind another another Sheriff & beat him down in 1 blow. So in 1 turn, she just about took out half my Lurker gang, earning her the nickname of Bludgeoning Betty. With the immediate Lurker threat dispatched the agents quickly tried to high-tail it off the board. Unfortunately, the remaining Sheriffs' marksmanship took a heavy toll, gunning down both Jack & Betty as they ran off. Here Murphy stops for a quick forelorn glance at his collegues shot in the back before escaping to safety. 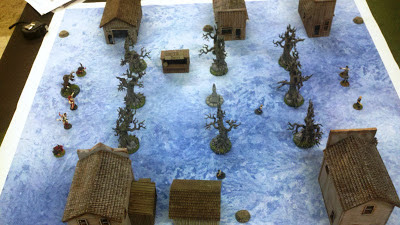 We then reversed roles and I ran the Threshold gang from the our 1st game a few weeks ago through the same scenario. Skrapwelder based his Lurkers around an 11 point Maniac. He gave the Maniac the Sneak skill, which put him within 1 move of the Threshold on the 1st turn. The Professor went down 1st. Then, after watching the Maniac slaugther her father, his daugther blasted him with her shotgun for 1 point of damage. But the Maniac tore through everyone else so fast the game was over in about 15 minutes. The other 2 Lurkers never even moved. We decided to run the game again, but this time Skrapwelder came up with another set of Lurkers, 2 Deep Ones & 2 regular Cultists. Luckily, he kind of forgot the objective was for the Threshold to get off the other side of the board. So he was momentarily surprised when my agents just kept running past the Lurkers. & yet again, the Reporter accompanying Threshold was caught & savaged, this time by a Deep One. I think the local paper is going to stop sending Reporters on these expeditions (or I'm going to have to get a bigger variety of figures to denote Civilians). My agents quickly outpaced the flopping Deep Ones. & rushed off the board. "Come on Dad! Just through these trees & we should be back at the Wardrobe." 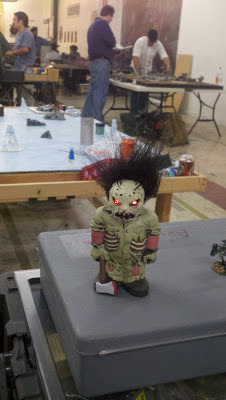 & here is our Strange Aeons mascot. Skrapwelder's wife found it somewhere. So now whenever a figure dies in the game, we squeeze this little guy to make him utter a hideous shreik while his his eyes flash red. Overall, we both enjoyed the games, & will be planning another one soon. We will probably be having the 2 campaigns diverge from each other, so we can develop in secret our own nefarious & dastardly plans for the other's agents.